After a slightly underwhelming dinner at The Manor the previous evening, a morning full of surprises and my failed London transport planning, we arrived at Paradise Garage 20mins late. He chose the venue because they are supposed to serve great Bloody Marys, though our expectations of the food somewhat dwindled after our experience at The Manor. The restaurant was only a few railway arches from Mission. The cosy dining room was warmly lit with hanging light bulbs against white tiled walls; the dining tables were much more polished than its sister restaurant. The menu was not dissimilar to The Manor, we spotted similar ingredients in slightly different recipes. Given there were four of us plus a baby, I opted out of the tasting menu and chose a couple of small plates from each section and the signature whole rabbit as our main. Bloody Mary - tick. Yep, I ordered venison tartare at The Manor and yes it was the second venison tartare in 2 consecutive meals. And if he hadn’t reined me in, I would have ordered venison tartare again at Bob Bob Richard that evening for dinner too. What can I say, I really like it! The mildly seasoned venison was diced in small cubes and served with a semi-cooked yolk, which reminded me of the one in Smokehouse. 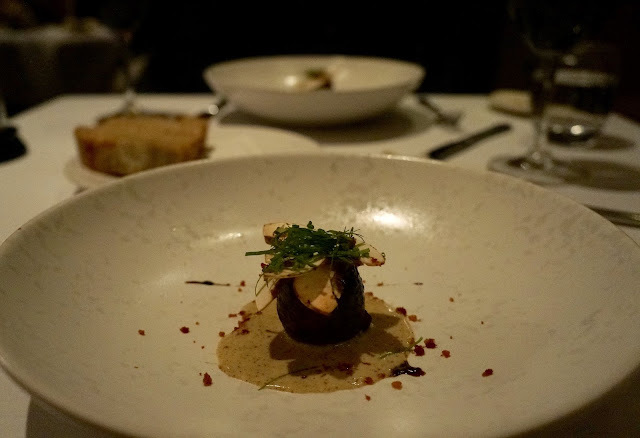 The gooey egg carried an intense richness that accentuated the raw brilliance of the meat, drawing out the delicate flavours with a smooth mouthfeel. Interestingly he didn’t like this venison tartare as much as I did. He felt the preserved custardy yolk somewhat defied its purpose and left the meat dry. 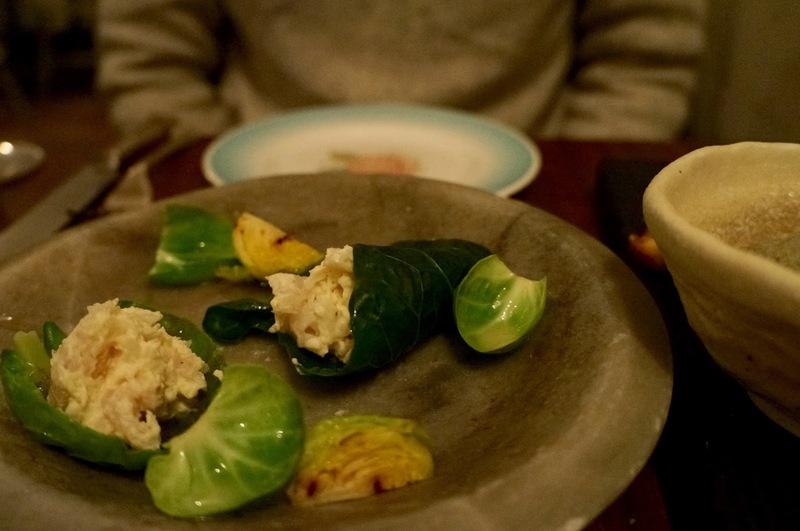 The leek was succulent and sweet, lightly charred on the outside to give it a touch of smoky bitterness. 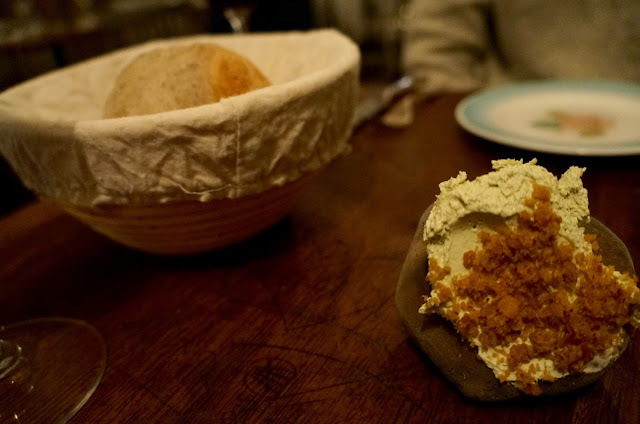 The airy mousse with light yeasty, cheesy aroma served as a dip to the crunchy leeks. The toasted buckwheat was quite hard and harsh on teeth, I would have preferred to have gone without. Still good overall. This was excellent. The lamb cutlet was roasted to a scarlet pink and of milky tenderness, with a small rind of charred fat that oozed the soft nutty taste of lamb, complemented by the bitter greens and meaty jus. The small nugget wrapped in a crispy shell clung onto the creamy sauce; it was a delectable contrast to the delicate chop. The cubes of octopus tentacles were bouncy but not overly chewy; its seafood sweetness has disappeared but the dollops of roe cream and verde salsa-like dressing made up for the flavour. It was good, though nothing too impressive. This rabbit was much bigger and meatier than I expected. The saddle brese was soft, similar to chicken though perhaps juicier; with a healthy pour of the thick flavoursome gravy, it was a satisfying mouthful of boneless chow. 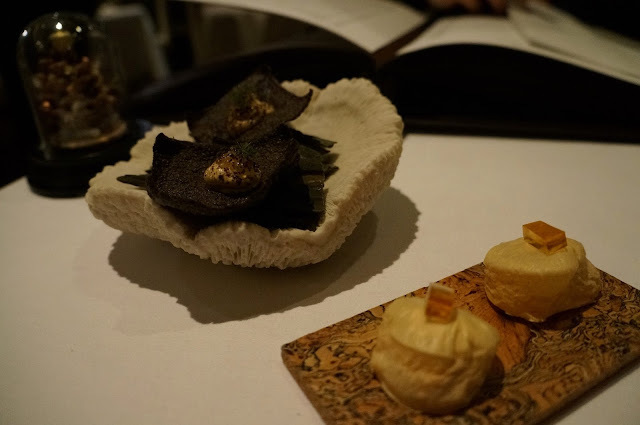 As an avid pastry lover, he particularly appreciated the turnover that was packed with shreds of rabbit meat and root vegetable dice in a thick broth, encased in crumbly, fluffy pastry. It was an excellent alternative to a Sunday Roast. The beer ice cream was particularly interesting. the huge cloud of cream was malty with a distinctive wheaty-bitter aftertaste. We spent the better part of our Sunday afternoon in the warmth of Paradise Garage. It was a great space for catching up - good cocktails and nibbles for sharing in a cosy bubble of relaxing ambience. Staff was attentive and friendly, and most accommodating to the little one (who was on his best behaviour). Despite a similar menu to The Manor, I thought PG took more care in their cooking, delivered cleaner recipes where ingredients work better together. 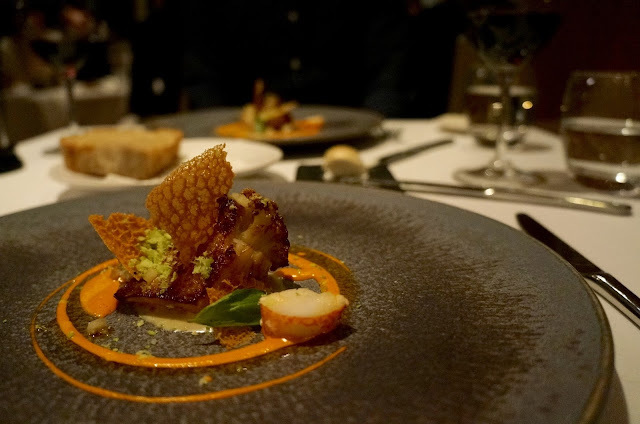 The Manor was one of the rising stars two years ago, and it expanded rapidly to open The Dairy and Paradise Garage, all have earned raving reviews. 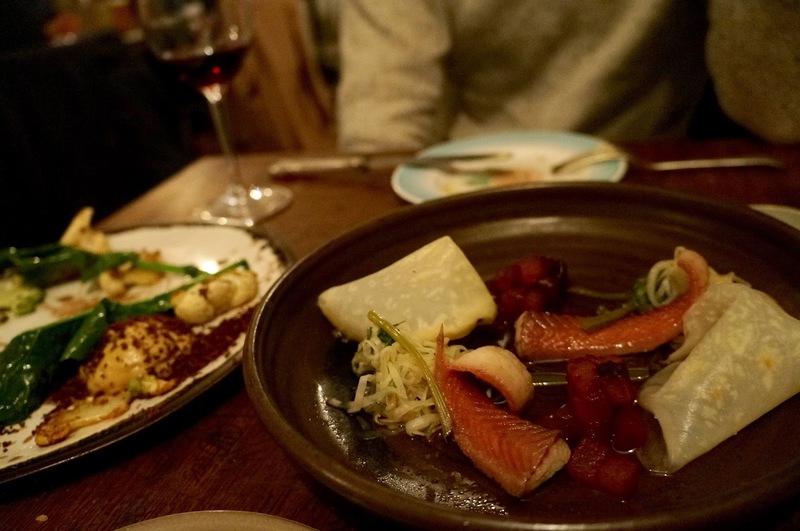 On the second day of 2016, we decided to venture all the way to Clapham for dinner. 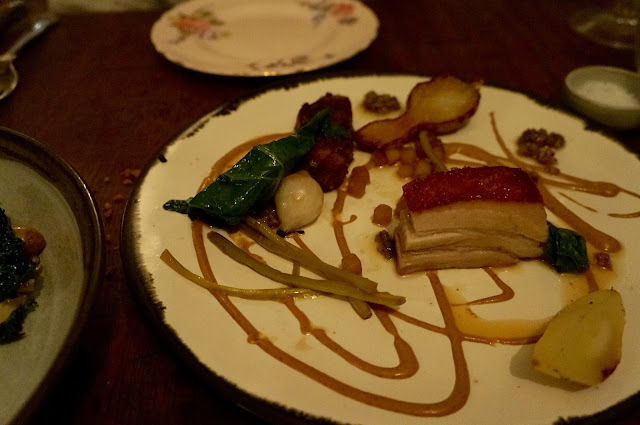 The restaurant boasts warm country-house shabby chic decor; wooden floor paired with old-school furniture - our dining tables had all kinds of scratched scribbles, as if they had previous lives in an old school. Our server greeted us with filtered water and explained the menu to us; we opted for a la carte to sample more dishes. We started with amuse bouche and warm sourdough bread with freshly churned butter and chicken skin scratchings. I couldn’t help but compare the butter with the ones from Viajante, which was still the best. The cold stone holding the butter was a good idea… until all the scratchings simply fell onto the table when we scrapped the butter with our knives. No one told them this wasn’t working? No it’s not the leftovers; this was how it arrived at our table. To be fair it appeared quite stylish at the time, with the venison cubes swooshed along the curve of the plate, mingled with crunchy pieces of crouton, drowned in a meaty gravy glaze. 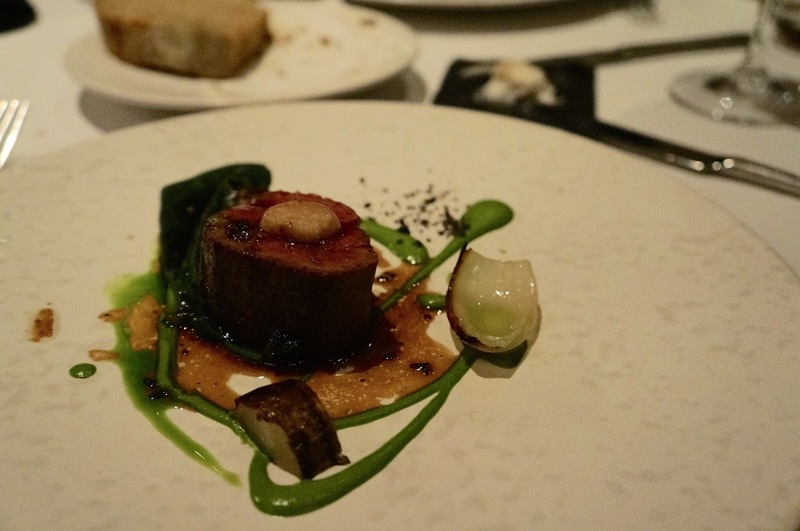 Unlike like a typical zesty tartar, this was warm, savoury and on the heavier side of seasoning that somewhat drowned the gamey flavours from the venison. I still enjoyed the textures and rawness in the meat, but I prefer a more conventional tartar that allows the delicate flavours to come through. This was the best of the three snacks. 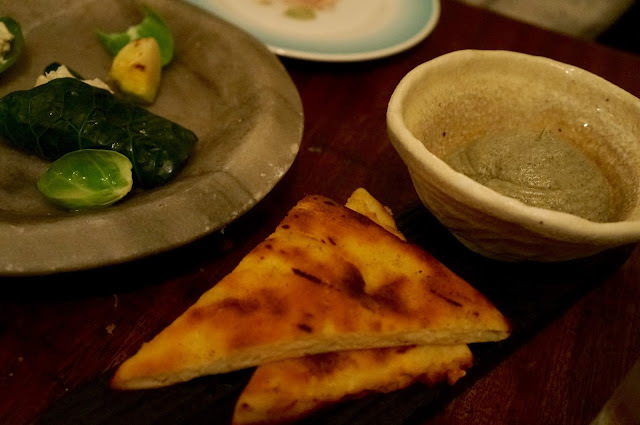 The aubergine puree carried a distinctive smokiness that was balanced by a healthy dose of refreshing mint. It had a middle eastern flare to it. I’m a fan of cod cheeks - super bouncy when raw; slithery soft when cooked – so naturally I had high expectations when I saw this on the menu. It was definitely unexpected to see it served as a yoghurt-like mixture in a leaf. But nothing could have prepared us for the salt attack; it was fiercely over-seasoned. At first I thought it was just a heavy pinch of salt for garnish, but then I was hit by a second wave of saline ambush, even the bitterness from the leaves and sprouts couldn’t save it. It could have worked I suppose, the thick viscous cream and springy cheeks had a playful and robust mouthfeel, just needed more control. We pointed this out to our waitress when she cleared our plates, and she amicably offered to remove the item from our bill. It’s always good when they care about our feedback. So… I didn't know what dulse was and so it was hard to know what to expect; turns out it's a type of seaweed. The whole dish had a bitter tone to it. 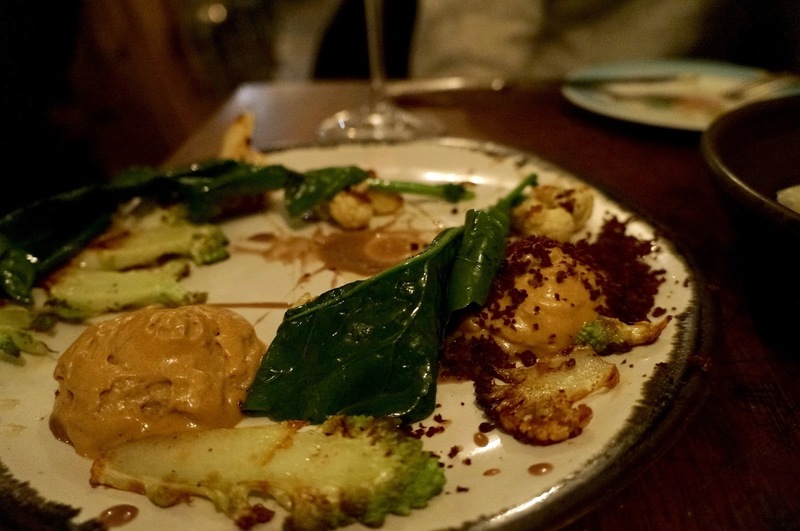 The slices of cauliflower and romanesco were charred on the outside with a soft centre, together with the leafy green that carried a gentle bitterness, which worked well with the dollops that tasted like toasted brown rice, whipped into an airy cream. 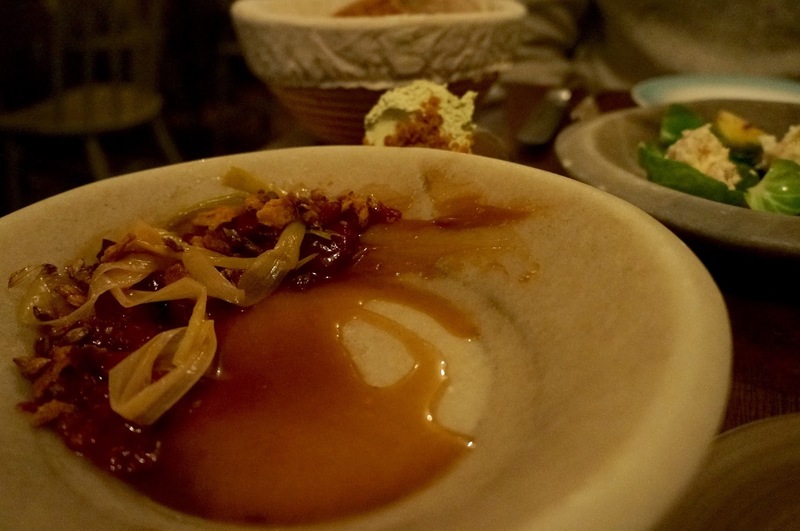 This gently pickled dish was a refreshing break to cleanse our palates. The eel fillets were plump with a thin lining of fat that melted in mouth; its pungent flavours were dissolved by the tangy dressing, uplifting the array of pickles. This had to be the most rubbery suckling pig ever existed. I spent a good minute cutting into the meat and he spent forever chewing it. The skin lacked a crispy touch, instead it was a gloppy gelatinous shell that refused to crack. The layer of lard in the middle was strangely elastic, making the meat sinewy and rubbery - at least it held ample pork juice. Interestingly the braised head meat was compressed but not deep-fried with breadcrumbs, I can’t decide whether it worked. Bottomline - we didn’t like it. I’m sorry it’s looks like the pigeon has gone missing in this photo. The breast fillet is hidden under the small pile of cavolo nero while the small leg of the bird was sticking out of the plate. The presentation wasn’t great - I agree. It tasted better than it looked though. 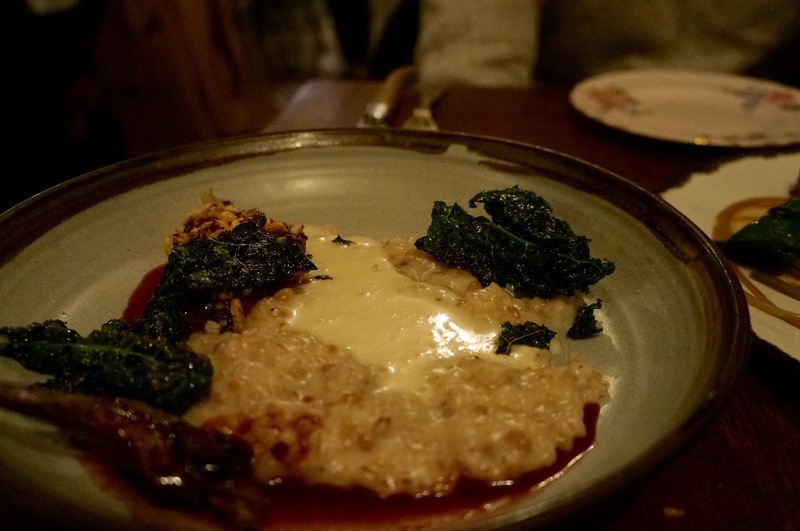 The raw bloodiness of the pigeon was prominent, paired well with the bitter greens but balanced by the creamy oats that had a bit of bite. The toasted crusty grains that topped the pigeon breast were unnecessary though, they were more hard than crispy, poking at my teeth. Hi Prunes, we meet again. 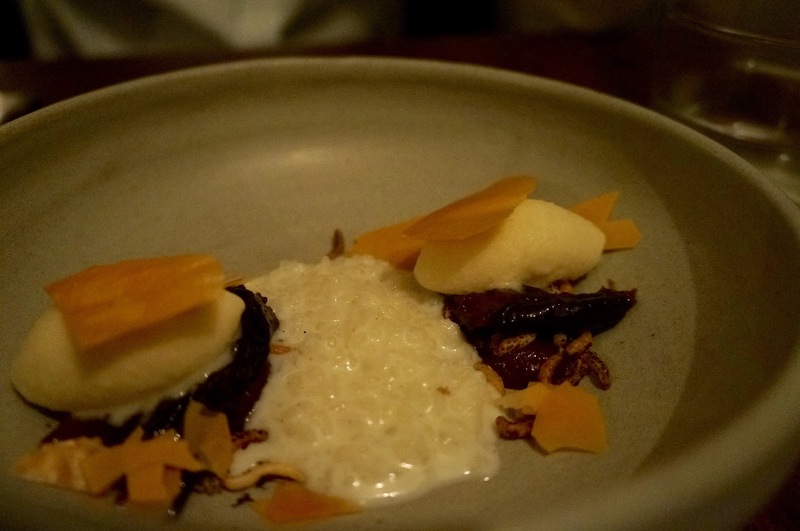 Despite being a fan of rice pudding, this wasn’t worth writing home about. The Manor reminded me of Lyle’s; the whole New British cuisine doesn’t quite click with me. I can understand the controlled chaos and using only seasonal produce, but what’s seasonal don’t always work with each other and sometimes it end up more chaos than control. 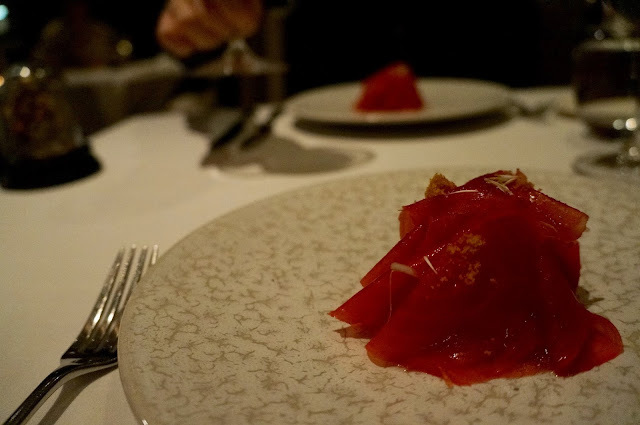 I guess what it lacks is finesse; there is little depth or layering to the dishes in terms of flavour, even if the ingredients should potentially complement each other, it was more like single blunders of flavours in each course. Perhaps had the seasoning been more careful, I would have enjoyed it more? The Ledbury is an occasion restaurant; he decided my 2-week homecoming was an occasion. I was excited. The dining room was elegant but intimate, a relaxed ambience without losing its finesse and poise. There was no a la carte option in the Christmas and New Year’s period, only a 8 or 10 course tasting menu; he was keen to go with 10 courses. We opted for a bottle from my favourite Saint-Emilion region, Château Giraudels de Milon, and the sommelier said why change from something you already know you like. True that. There were nibbles and amuse bouche; the small brittle balls that exploded with a warm savoury, gamey mousse were particularly delicious. The thin sheets of beetroot were masking a small pile of eel, plump and bouncy, packed with powerful smokiness. The earthy sweetness from the beetroot helped to dilute pungent tones from the smoked fish without taking away its delicacy. 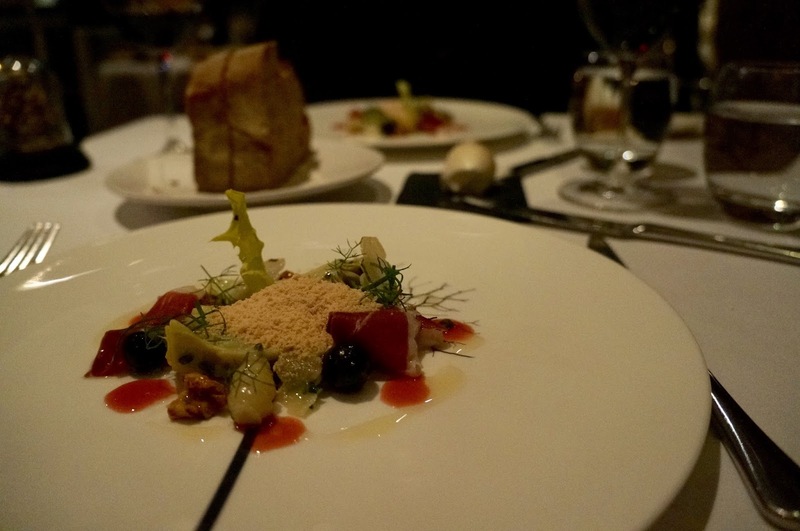 This small ensemble of complex flavours, ever so carefully balanced, did well to awaken our palates. The small blocs of artichokes were juicy with a hint of nuttiness, which worked well with the toasted walnuts and syrupy blobs of grape. The highlight was the crumble of foie gras blanket, which melted in mouth to a velvety foie gras cream that brought each component together. It reminded me of the posh cousin of Wardolf salad. 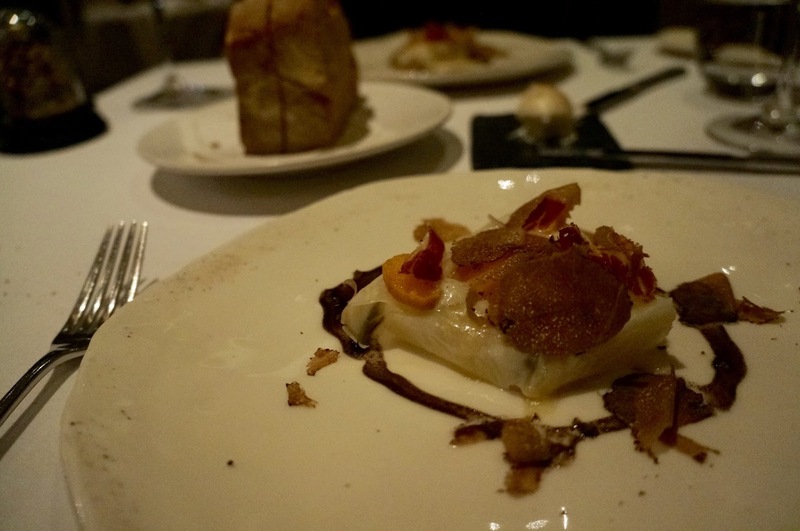 I could smell the truffle making its way to our table. The soft poached egg was wrapped like a parcel in thin sheet of celeriac, holding the wobbly egg white in. I felt the truffles were somewhat less aggressive; while its perfume penetrated it didn’t dominate to knock all other flavours out, instead it lingered in a more refined manner. It’s a sure-win combination of silky soft egg, sprinkles of fragrant ham and generous shavings of truffle. This was one of my favourite courses. The slightly charred cauliflower floret was mildly smoky, and its distinctive flavour worked magic with the luscious lobster butter, which was a concentration of shellfish bliss. The springy morsels of lobster casually scattered on the plate was just an added bonus. I say I don’t eat prune, the same way that I say I don’t eat dates and figs. Truth is, I don’t really know what prunes taste like and I’d eat it if I didn’t know it was there. So I told myself there were no real prunes in this dish. I’m glad we had this with the 10 courses – I was convinced it was only in the shape of a prune. 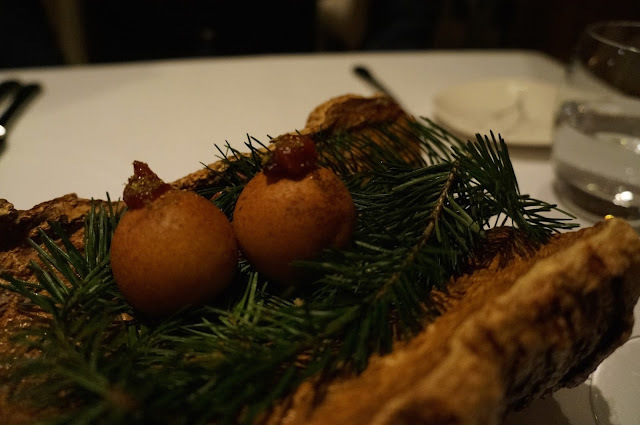 The fruit was filled with a dense partridge mousse that resembled an airy, smooth pate, its richness was offset by a mushy sweetness (from the prune I assume). The raw slivers of fungi were crunchy to add more bite, soaking up the tea-infused jus; although the earl grey fragrance was probably too subtle to push through. Perhaps I do eat prunes after all. This was simply gorgeous. The filet was a perfect medium rare with a deep ruby centre; the lean muscle was of marshmallow softness and boasts refined bovine goodness. The small disc of bone marrow added some beefy butter to the meat, with a hint of smokiness that gave extra depth with the slight bitter undertone from the peppery puree. I thought the warm donut on the side stole the show. This reminded me of the traditional Cantonese milk pudding made by pouring milk against ginger juice - then it miraculously sets. I think it was the ginger. 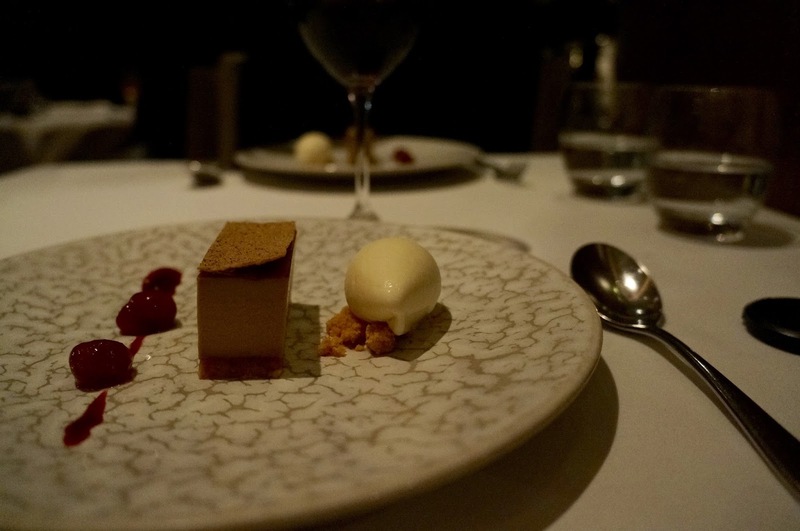 The Ledbury certainly lives up to its 2-Michelin stars. The menu was sophisticated and balanced, with a healthy dose of innovation that experiments with a vast range of ingredients and textures; each course was well designed and flawlessly executed. I suppose after a few months in Singapore, I've learnt to appreciate the variety in ingredients much more in London. Service was impeccable, our server was most charming - conversational without being intrusive; courses were well-timed despite us being slower than most. Possibly one of the the best meals I have had. Ever. It was a perfect finish to a beautiful year. Thank you for making me feel special.